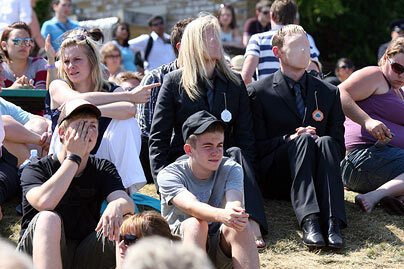 At some of the most high-profile events this summer, Elton John’s White Tie and Tiara Ball, Wimbledon, Henley Regatta and the Harrods sale, some mysterious nameless, faceless figures have appeared in the crowds. Is it performance art as some speculated? 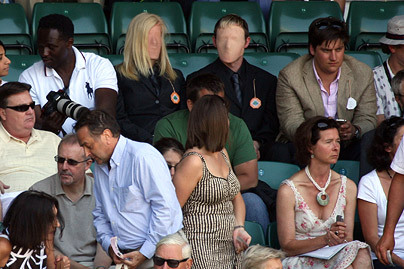 Some celebrities in masks, trying to avoid the paparazzi? Actually no – it’s most likely an attempt at viral marketing by Lotus cars as you can find if you click here. As I saw this I was reminded of a number of prophetic words given in churches and conferences over the years about a ‘nameless and faceless’ group of people who would rise up and do amazing things for God, in fact they’d appear in some of the great stadiums of the cities of the world (I’m not sure exactly who first coined it, I heard a man called Jack Deere teach on it once). How would it feel to be one of those nameless and faceless people? How would you qualify? Ecclesiastes 9:14 says There was once a small city with only a few people in it. And a powerful king came against it, surrounded it and built huge siege works against it. Now there lived in that city a man poor but wise, and he saved the city by his wisdom. But nobody remembered that poor man…. Here’s my question as I read that – would I be happy if God used me to save a whole city, or to do some amazing miracles, even if nobody knew…? To be honest, it’d be a struggle for someone like me to be nameless and faceless. While I remain convinced that the outpouring of healing at Lakeland is genuinely a work of God – albeit as always, through imperfect people, I’m sometimes concerned by the elevation of particular people. There’s nothing good about the naming of names like e.g. Benny Hinn & Kathryn Kulhman etc. some involved can fall into in a bid to seek to authenticate or bolster credibility (actually it’s a dangerous way to do it, as whoever you mention, someone will have a problem with them!). There’s also a great deal we Brits are unhappy about when it starts to look like promotion of people rather than God, and that’s a hostage to fortune. Look at a few blogs and it’s obvious that some people are very certain (because of their presuppositions) that any reported healings etc., must be bogus, and others that Bentley & co are just in it as a money making scam. Perhaps I’d point them to the message on the Lotus site … true character will emerge. We’re not to worship the signs anyway, but the Lord the signs point to. If I was travelling to a city and saw a sign pointing to it, I wouldn’t get out and hug the sign! But if the sign points me along the right path (look at Proverbs 4 for that) then I’ll be sure to embrace the one the sign is directing me toward. We have to resist any temptation to name drop – you can’t drop human names while lifting up the name of Jesus. I would only add that where you say: “There’s also a great deal we Brits are unhappy about when it starts to look like promotion of people rather than God..”. Instead of Brits, I would have said Christians, because I think, given that we consider ourselves worthy to be called followers of Jesus Christ, we should be the very first ones, regardless of nationality, to point out to those around us, those occasions when ministry has become our number one priority, our idol, instead of the means to an end; those occasions when our ministry draws attention to ourselves instead of lovingly directing others to God and their own ability to have a personal relationship with Him and to be used by Him as much as the next person. It takes a very special kind of person to be able to, firstly, spiritually discern the true motivation in someone’s heart and to raise the issue, when it is deemed to be the wrong motivation. This is something that can only be achieved if/when God has given that person the right annointing and the command to do so. If we run ahead of God in this area, the results are always disastrous. Secondly, it takes an even more special kind of person (a person after God’s own heart as their single pursuit in life) to trust in God’s perfect ability to be the sole judge of each of our actions and attitudes, and to bring justice, truth and punishment in those instances when it is needed. The temptation, at least for me, is often to point the finger and drop the name. I did that with someone recently and Jesus’ words “He who has no sin,let him cast the first stone” have been ECHOING in my ears ever since. Not nice! I promise you. Won’t do that again.